Hi, Lidy Baars from FrenchGardenHouse here. 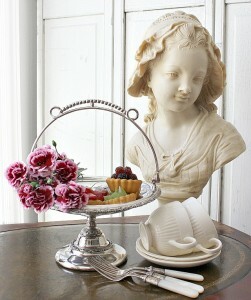 Nothing makes me happier than to set my dining table or tea table with a beautiful, gleaming silver Bride’s Basket. Inspired by my love for shiny, elegant things, I bought my first Victorian “bride’s basket” long before I became an antiques dealer. I was 16. When other girls my age saved up for a Beatles album, I saved up for a Victorian silver cake basket. Over the years, I have bought and sold many of these beautiful baskets, one of my favorites to Phyllis. I am thrilled to share a little of my love for, and knowledge of, these cherished wedding gifts of the Victorian era. Silver has long been used to mark special events, and silver baskets, now called bride’s baskets, became extremely popular in the 1880s as a luxury gift for a bride on her wedding day. An elegant expression of beauty, love, and graciousness, silver baskets made of coin silver and sterling silver were used in weddings in the early 19th century by flower girls to scatter flower petals down the church aisle—or in the case of extremely well-off bridal couples, costly orange blossoms. 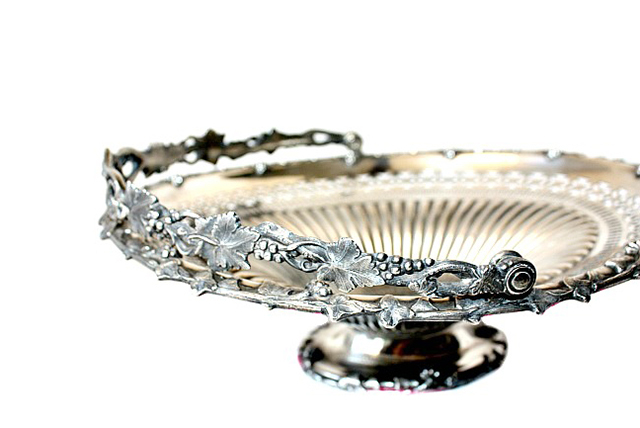 By the mid 1800s, wealthy brides used silver baskets during their wedding ceremony, and it was also customary to place the basket on the main table during the reception luncheon or dinner to showcase the bridal bouquet. Once the bride and groom, now a Mr. and Mrs., returned from their honeymoon, the happy couple used their basket to present cake, sweets, or fruit while entertaining and prominently displayed it as a centerpiece on their sideboard for elaborate dinners for friends and family. It wasn’t until the last quarter of the 19th century, however, that the bride’s baskets we collect and admire today were made. Silver companies began to produce more and more affordable pieces in quadruple plate (silver plate) so that they would appeal to a larger market. Instead of being sold “by appointment” in exquisite jewelry shops only, silver and semi-luxury gifts were being sold in dry goods retail emporiums such as Macy’s in New York and Le Bon Marché in Paris. Many companies produced silver-plated holders, and a glass insert, often hand painted, was chosen to complement the stand. Highly favored as wedding gifts, the baskets were made by many illustrious manufacturers such as Pairpoint, Meriden, Reed & Barton, Rogers Bros., and Britannia. The bowls were made in almost every color with crimped, ruffled, or fluted edges; cut-glass bowls became popular after 1890. 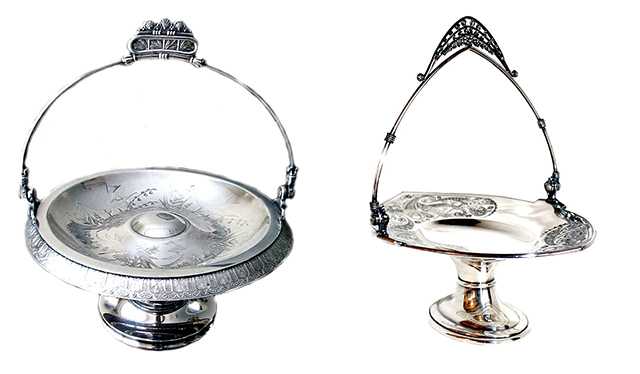 Along with stands and glass bowls, companies also made “cake baskets” of silver plate. Often decorated with inspired hand engravings of fruit, flowers, cherubs, birds, and vines, all symbols of new life for the bride and groom, there were almost as many variations as there were bridal couples. It is noteworthy that the manufacturers did not call these “bride’s baskets” but cake or fruit baskets. The name “bride’s basket” is a more modern reference to these baskets. The bride’s baskets went out of favor as “the” wedding gift in late 1905. The baskets, both those with glass inserts as well as those without, are avidly collected and much sought after. 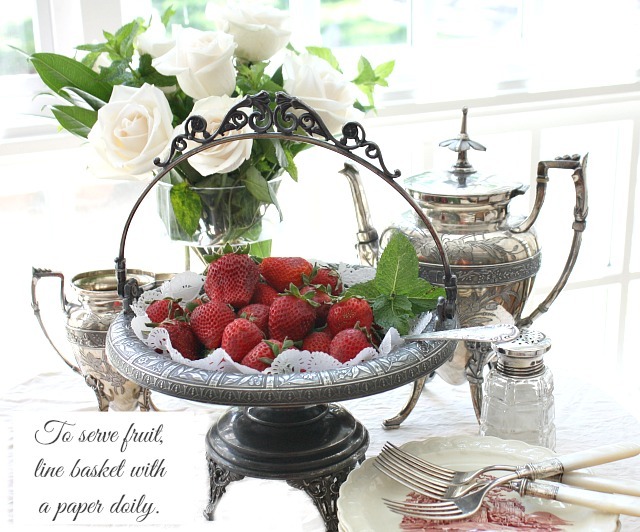 They are beautiful to display on the table, filled with cake, fruit, or flowers. I have used the baskets in my home for their original purpose but also in our guest bathroom with exquisite soaps and antique hand towels, filled with shells in the summer on our coffee table, and to display antique Christmas ornaments for the holidays. If you want to collect these treasures, look for the best quality basket you can obtain, with no damage to the plating, especially to the engraved floral design in the bowl. Some wear is to be expected, as these pieces were used and are more than 100 years old. There are collectors out there who do not polish their silver and prefer the dark patina of time, but if you want to be sure what the silver looks like underneath, I suggest only purchasing pieces that are polished and cared for, from a reputable dealer or shop. For the glass insert-type of basket, look for a bowl without chips or damage to the hand-painted designs. The bowl should fit firmly in the stand; if it moves around quite a bit, the bowl and stand are most likely a marriage and did not start out together. This decreases value a bit but should not mar your love for the basket if it is in beautiful condition otherwise. I hope you have enjoyed learning about these lovely antique baskets and will grow to love them as much as I do! Do you collect bride’s baskets? I’d love to hear about it! Lidy a few years back I was at an estate sale of an elderly couple and they had 2 very unique wicker baskets with handles and lids. I was told they were wedding baskets. I was wondering if you could tell me if this could be possible since all your writings only talk about silver ones. I was saving them for 2 special couples but hate to say they are one thing and it not be what they really are. Im not really good at attaching pictures but if you would like to see them I will have someone help me get them posted. 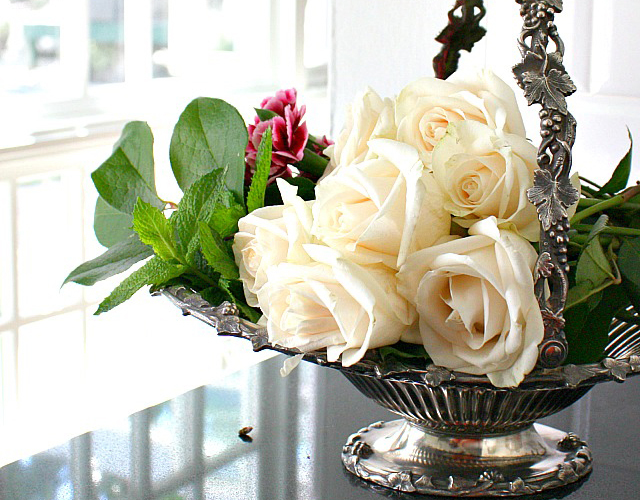 Can antique sterling silver bride’s baskets be used by the bride to carry her bouquet to the altar? You know the kind-pierced sterling silver with transparent/clear glass insert. Hello – What is the history of the pink ruffled glass bowl you share in your blog post? I have a cobalt blue one that looks like its twin. It sits in a lovely silver basket which I am just learning is a bridal basket. Thank you for a sweet post. how do I date a-Meriden brides bowl holder. The one I have in mind to “fit” my wifes inherited bowl (its a Dugan Glass Co ruffled peach opal 10 inch bowl from 1904 or 1905) is numbered 1677USA. how does this line up for a correct “date” for 1904 to 1905 as Dugan just started his company. He was Harry Northwoods BIL. I’m just starting my collection , i was lucky enough to come across 8 beautiful sets at an estate sale for a mere $40 each . I would love to have someone that knows more about them (than me) to look at them and tell me their value. Who would u bring them to for this? I have seveal pieces from my great great grandmother and one is the bridal basket, without the stand. I guess it was lost years ago. Unfortunately, I think the stand is what would have the manufacturer’s mark. Any advice on how to determine where mine was made, so that I could find purchase a stand to go with it? It has etchings of birds inside the bowl, with a monogramm in the center. She was from Baltimore and married in the mid-1800’s. I have scored google images, but nothing exactly like the one I have. My friend is going through her mothers estate and has found a metal brides basket 19 inches tall and I think the removable base bowl is about 5-6″ diameter. if You would like i could send you a picture. Why do you give the date 1905 as when these went out of style as “bride’s baskets”? Mine was given to my grandmother in 1920. I understand people could still give them and use them as such, but I’m curious as to why you use the exact date. I have a bride’s basket with a lid that we think might also be a potpourri basket. I haven’t seen many with this type of pierce work for the lid and repousse on the body and handle. The basket lid is topped with a perfect little acorn. I have photos if anyone could help me figure out what this is, I would be most appreciative. The dimensions are 14 h, 13w and the depth is ten at the widest point. It is quite heavy, yet delicate. Thanks in advance if you have an idea. I knew I had a bride’s basket, as it was a wedding gift to my great great grandmother in 1860, but I did not know the purpose or use of it. To know it may have been used in her wedding makes it even more special to me. I love it and use it for all sorts of things! Thank you for your information! Sylvia, I sell all those things, the availability differs at times, but you can find the link to my online antique shop on the right of this blog, FrenchGardenHouse. Memories, memories! Grandma had a bride’s basket. It was glass, and white on the outside with a pink interior. I always admired it. And she also had some of the silver ones with a colored glass baskets. When I see articles on antique pieces I think of my Grandma who was an antique dealer in Birmingham for years. I am so very fortunate to have many pieces that she gave me. They always remind me of Grandma and Grandpa, and the love they gave me. I love this, Patricia! It’s exactly what I hope my own grandchildren will remember when they see beautiful antiques later. Thank you Lidy for such an interesting article- I have a couple of Bride’s Baskets and have always been curious about there use-I love them and now have a better idea of how I’d like to display and use them ! Thank you Diane. I hope you will display and use your baskets so that their beauty will make you smile each time you see them! Do you sell the items listed here? Do you sell 19th. Century Transferware? Or 18-19th. Century cake plates? Fenton glassware? Thank you, Linnea. How wonderful that you love and use your baskets you inherited from your grandmother. I know you love them for their beauty, but also for the special memories and connection to her they have. that belonged to my grandmother who was married in 1906. 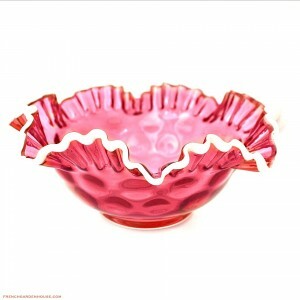 I also have her lovely ruffled glass basket in three shades of pink which sits on the original pedestal. I used all three today for a tea party for friends. Rue, thank you. One of these days that basket will make its way to you, and you will have all sorts of lovely memories to go with it. I loved this article! I now am in the hunt for a bride’s basket! Thank you Janet! Happy hunting! I just read your article and am amazed and delighted to discover that I also have a bride’s basket. I purchased it at a yard sale years ago, not because I knew what it was, but because I loved the way it looked. It has added beauty to my living room, but now I’m thinking of moving it to my tea room (also known as my dining room). Thanks so much for such an informative article. Kathryn, that is what I love most about using Victorian antiques today. We are not bound by the same strict rules as the Victorian ladies, we can enjoy a beautiful piece of silver for its original purpose, or move it around the house. I use my silver in the most unlikely places, to hold towels and soaps in the guest bathroom, to cradle a bunch of easter eggs from my childhood in spring on my hallway table. 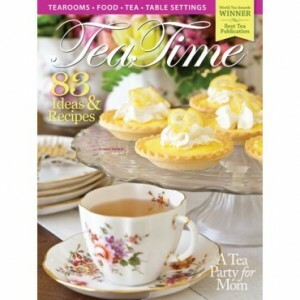 The cake baskets do love to present delicious tea scones and petit cakes, that is really when they are in their element! I would love to know any online antique dealers that you would recommend for finding a bride’s basket. I would love to find one for a wedding gift for my cousin. I will share this article on my gift and etiquette blog – just love the history behind these baskets! Lee, there are many reputable dealers online that sell bride’s baskets in many price points. In my own online shop, I have them on occasion if I can find one or more that I love, but if you use a search engine on your computer for brides basket or antique cake basket, you should be able to locate many! Really enjoyed your article. I do not have a silver bridal basket yet. Have been on the “hunt” for awhile now. I do enjoy my cut glass basket collection. Plan to put them out tomorrow for the month of May. This was very interesting to read the article. Never heard of a brides basket but something else to search for on my travels. Thanks for all the information you provide. My husband and I inherited a beautiful silver plate basket from his grandparents. It is not as elaborate as the ones pictured, but has a lovely fluted edge and a twining floral design engraved into the bottom of the basket. My mother-in-law says her mother used it to hold fruit at the table. I wonder if it might be a brides basket? I use it to hold various decorative items throughout the year, most recently a collection of smocked Easter eggs made by my mother. Jen, it very well might be. The twining floral design sounds lovely, that it belonged to your husband’s grandparents makes it priceless. I have a silver one that I have put roses in as well as treats. I didn’t have a clue as to the brides basket history until today ! I loved reading the article- Thank you. Thank you too, for sharing the ribbon in your journal. It is always full of wonderful stories, tips or recipes. Thank you again. Oh my goodness – so excited to receive this article regarding “bride’s baskets” as I inherited one from my mother and knew nothing of their background. I was told it was given to my great grandparents as a gift on their 25th wedding anniversary August 3, 1895. The basket is sterling silver by Meriden and is numbered 1673. The original bowl which came with it was broken long ago. Their daughter, my great aunt ,was working at a girls home for unwed mothers in Asheville, NC, in the late 50’s or early 60s and was shopping in downtown Asheville when she spotted a bowl in the window of a store almost identical to the original. It is very similar to the one you show – pink inside, scallopped edges and white on the outside. Needless to say my mother was thrilled. I also have the invitation sent out for the celebration of their 25th anniversary framed and next to the “bride’s basket”. It was ,of course, written with a fountain pen in beautiful flourish hand writing script of those days.Thank you, thank you, I love getting these e-mails so full of information and beautiful things. 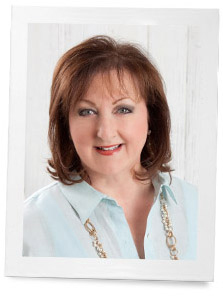 I love your story about your bride’s basket, Jan. It is not only so special that you inherited it and that you have such beautiful family memories, but that your great aunt was able to find a bowl to fit it again. So exciting! I love hearing stories like yours about antiques. This was so helpful; I’ve had a silver Bride’s Basket and didn’t know what it was. Right now it is holding napkin rings. Thank you Carol. I bet it’s gorgeous with the napkin rings. That is what I love about baskets, they can be used to display anything, but are stunning even when empty! I really enjoyed learning about these beautiful baskets also. Maybe I should sell some of my vintage Beatle albums to purchase one – or maybe I will save up like I did for each one of the albums. Would love to add one of these to my collection of teapots and dishes. Cheers! Jeannie, the baskets are a perfect compliment to teapots and dishes, but vintage Beatle albums are pretty special and collectable too. Thank you for delightfully informative article. I have collected a variety of baskets for many years. Due to my Grandmother and Mother’s influence, I learned to love and started collecting quality items while in my early teens. Several of my baskets are truly old friends to be enjoyed over and over — especially during the month of May! May Day, Mother’s Day & our anniversary are especially perfect times to fill bright shinning baskets with wonderful espressions of God’s bounty in glorious Spring bouquets! afa, you are so welcome! I love that you consider the baskets “old friends” and use them for special occasions to create memories with your family. I am fortunate enough to have received all of my dear Mother-in-law’s silver and as I was reading your article, I realized I’d seen a “bride’s basket” among her things. Woot! I remembered seeing and thinking how pretty it was and what it might have been used for. As most of it is packed away for the time being, I’ll be going through the boxes this weekend to find it. So excited! Thanks for the wonderful article!! Oh! Treasure…how delightful, I hope you discover all sorts of beauties Sheila.